Students choose to learn Spanish in El Puerto de Santa Maria because the area is unspoilt, the weather is wonderful and the beaches are magnificent! Courses are available year round and the Spanish lessons usually take place in the morning, leaving the afternoons free to go to the beach or explore the area. 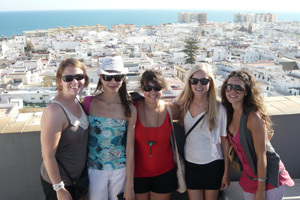 El Puerto is a typical Andalusian town, set among beautiful beaches, bathed in sunshine 300 days a year. The surrounding region is famous for its mountains with their picturesque white-washed villages, its seafood cuisine, and best of all, the exuberant and friendly spirit of the Andalusian people. This town is very popular with Spaniards as a holiday destination, because of its breathtaking location and glorious climate. El Puerto is a truly Spanish town, supposedly where Flamenco dancing really began, an ideal place in which to immerse yourself in Spanish language and culture and learn Spanish. Our school in El Puerto de Santa María is located close to the old town centre and just 10 minutes walking distance away from the beach. The school is fully air-conditioned, has 6 classrooms, as well as a rooftop terrace, where the school hold barbecues. Wifi access is available throughout the building. The school also have an on-site residence, so students can step out of bed and into the classroom! In addition to Spanish lessons, the school arrange a varied programme of activities, many of which are included in the course fees. Fly to Jerez or Seville Airport and take coach/train to El Puerto de Santa Maria. Airport transfers can also be arranged from Jerez Airport in July and August.